“We know only too well how the river Shannon can bring flooding to our town but on this occasion we are celebrating a more positive side to our waterways. In Portrun this year we are launching a book by Donal Boland focusing on the secret and hidden beauty spots on the Shannon”, explained Mr Rowe. “We are also working closely with the RNLI”, he continued, “and this year we are focusing on taking a more proactive approach to boating safety. The 56th Shannon Boat Rally is an annual event that attracts private boat owners and their families to the Shannon for their annual holidays, contributing to the local economy for the past 56 years. From its origins, the rally has grown in popularity every year attracting all classes of boats crewed by over three hundred adults, teenagers and children who participate in sports, games, sailing and boating competitions, quizzes, talent and music events while improving their boating skills and safety practices on our waterways. The rally brings boaters of all abilities and experiences together to share in a common purpose to enjoy the waterways, to share boating know-how and improve their boating skills. The boat rally has attracted many boaters to our inland waterways and promoted development of facilities along the navigation as well as bringing a great dynamic and valuable business to the towns and villages along the river and lakes. The boat rally also encourages responsible use of the waterways for the benefit of all waterway users and has a strong educational, environmental and boating safety theme. #MajorBypass -A contract for a major €230m New Ross Bypass and 900m river bridge was signed last week, following numerous false dawns and political promises, reported the Wexford People. The sod turning took place on Monday of the new bypass bridge of New Ross, by the Minister of State Paul Kehoe who said work will begin shortly. Upwards of 300 jobs are expected to be created in the construction of the bypass, while 2,100 jobs will be created through maintenance, repairs, bridge repairs, drainage and lighting the bypass over 30 years, according to contractors BAM Iridium. Once open to traffic in 2019 the new road will cut journey times by up to 40 minutes and provide a safer and shorter alternative to the current route through New Ross, eliminating the need for motorists to use the rat run at Raheen into the town. The new road will allow traffic on the N25 between Cork and Waterford to bypass the town of New Ross and cross the Lower Barrow on a new 36m high, 900m long four-lane suspension bridge. This will feature the world's longest central span three tower extradosed bridge, a type of cable-stay structure, spanning the River Barrow. The €230 million scheme will involve the construction of approximately 13.6km of new dual carriageway and 1.2km of new and upgraded single carriageway to bypass the town of New Ross. For more on this major infrastural development spanning the south-eastern river, click here. The Inland Waterways Association of Ireland (IWAI) has issued a public invitation to all candidates in the upcoming election to pledge their support for an IWAI call for provision to be made for new canal bye-laws via a dedicated Canal Bill during the next Dáil. Support for this on- line pledge will help ensure that adequate byelaws are legislated for that will encourage the use and growth of the canals and be centred on the communities, users and tourism. "IWAI request election candidates to pledge their support for an IWAI call for provision to be made for new canal bye-laws via a dedicated Canal Bill during the next Dáil when possible rather than including any future legislation in a joint Bill such as the Heritage bill 2016. Furthermore in developing The Canal (Amendment) Bill 2017 that recognition be given to the canal users, canal communities and Local Authorities adjoining the canals by way of pre-legislative consultation and scrutiny. This approach would be in line with Government reform and best practice." Candidates pledges of support will be registered opposite their names on the IWAI Website. Prior to the 2016 Bill, in January 2014 Waterways Ireland brought forward proposals for amendments to the Canal Byelaws 1988 under the Canals Act 1986 & Maritime Safety Act 2005. IWAI campaigned vigorously during the minimal consultation period of 21 days. Public discussion in 2014 on the matter included - the Canals and Barrow as a tourism resource; queries raised in the Seanad and the Dail; County Councils input; public meetings; national and local press articles; television and radio interviews; community websites; blogs and facebook pages. These all reflected the reservations of users, communities and public representatives as to the significant impact of the draconian suggestions in the proposed bye-laws. #LoughNeagh - Drone footage of the dramatic flooding around Lough Neagh has garnered over 7,000 views on YouTube. According to the News Letter, hundreds have been flocking to the region to see the effects of flood waters as the lough's level reached a 30-year high. However, any potential benefits in visitor numbers are far outweighed by the severe cost to local businesses, as previously reported on Afloat.ie. And flooding around the lough will continue to be a problem for the foreseeable future due to a combination of poor water flow control and unreliable long-range weather forecasts. That was the stark warning from Rivers Agency chief David Potter speaking to a Storming committee earlier this week, as the Belfast Telegraph reports. "In order to reduce the lough by a foot, we need between 25 and 38 days' notice, and after about five days our level of confidence in the weather forecast is pretty shaky," he said. "Hopefully that describes the dilemma that we are in. We can't anticipate to the extent that people believe we can." Meanwhile, a meeting in Brussels this week has dismissed as a myth the notion that EU regulations have prevented flood relief in Co Galway, which is still suffering the effect of December's winter storms. As Galway Bay FM reports, MEP Marian Harkin revealed that Ireland has made only one application for works of overriding public interest in the last 20 years, as the vast majority of decisions are taken at member state level. #InlandWaters - Quayside enhancements at Lanesborough-Ballyleague are part of a new project to develop facilities along the award-winning Shannon Blueway. The Flagship REDZ project was submitted by Leitrim County Council on behalf of the Upper Shannon ​Erne Future Economy (USEFE) project partners, which include Bord Na Mona, ESB and Cavan, Leitrim, Longford and Roscommon Local Authorities in conjunction with Waterways Ireland. The aim of this project is to develop the Shannon Blueway to support the wider economic development of the towns and villages along the Shannon and Erne Waterways. The blueway is a developing a multi-activity trail running alongside the water which links walking, cycling, canoeing, paddle boarding, angling and cruising with local amenities. ​Twenty-two towns and villages in the Upper Shannon-Erne region are inter-connected by the Shannon and linked canals, providing what Waterways Ireland describes as "a unique opportunity to develop the blueway concept". ​As part of the objectives of the REDZ Flagship project for the Shannon Blueway, the quayside improvements at Lanesborough-Ballyleague will be joined by an extension of the looped walks from Drumleague to Drumhauver, a multi-leisure section of the blueway from Carrick-on-Shannon to Drumshanbo. Click HERE to view a Facebook gallery​​ dedicated to the quayside improvements in Lanesborough-Ballyleague. #InlandWaters - The waters of the Lough Allen canal, Lough Erne and the Shannon-Erne Waterway will feature in the new series of Channel 4's Great Canal Journeys. Presenters Tim West and Prunella Scales filmed in the area in July 2015, beginning their journey in Drumshanbo, and between music sessions, poetry and hyrdoelectric locks, they tried everything on the trip up the canal and out onto Lough Erne where they visited islands, homes and castles. The series starts this coming Sunday (25 October), and the Irish episode will be broadcast at 8pm on Sunday 8 November on Channel 4, with catch-up available later via the channel's on-demand service All4. The inland waterways of County Kildare will be buzzing with boats this coming October Bank Holiday weekend. The Inland Waterways Association of Ireland (IWAI) Kildare will host it’s now annual Naas Canal Festival from Friday October 23rd to Monday 26th. A large fleet of boats is expected to assemble in Sallins harbour on Friday followed by a parade along the Grand Canal, up through the flight of five locks into Naas harbour. The parade will leave Sallins at 11am and all boats should be in Naas harbour by 5pm. In the spirit of the founders of the IWAI, who established the Association in 1954 to campaign against the installation of fixed span bridges across the River Shannon, IWAI Kildare will use the Naas Canal Festival to showcase the leisure potential of the Grand Canal in this area. Whether your passion involves travelling through locks by boat, paddling a canoe, walking or cycling for health, well being and enjoyment or waiting patiently for a bite on your fishing line, IWAI Kildare invites you to immerse yourself in the amazing engineering achievement that is the Grand Canal. Ireland is a country of seaways, and waterways which are dominated by the majestic River Shannon. On our island, you can never be more than sixty miles from the nearest navigable bit of sea. Add in the myriad of inland waterways – whether canals, rivers, or lakes – and you have an enthusiastically watery country where it is possible for everyone to have a floating boat berth of some kind within an hour’s journey – and usually much less – from their home. Afloat.ie’s W M Nixon has been cruising our inland waterways in detail for longer than he cares to admit, though he will concede his first venture on fresh water was in command of a 14ft clinker-built sailing dinghy with a tent, a cruise which took place well back into the depths of the previous millennium. But it’s an experience you’ll always wish to repeat as often as possible, and just last week he found himself going again to the waters and the wild, with a family cruise of three generations on the River Shannon’s great inland sea of Lough Derg. Journeying westward to join the good ship Slaney Shannon Star at Portumna on the frontiers of Connacht, the car radio was warbling on about the poor weather, and wondering why in England they persist in having their final summer Bank Holiday on the very last weekend of August, instead of having it earlier when the chances of good weather must be better. As it happens, we know that the chances of good weather at any time in the summer of 2015 were slim enough, though it was briefly present just now and again. Be that as it may, the reasons for taking your “summer holiday” as late as possible in the season seem obvious. Even in this era of flexi-time and working from home and project outsourcing or whatever, the idea of clearly-defined work time and holiday time are still ingrained in us. And of all our traditional holidays, surely it is the summer holiday which is the most avidly anticipated? Anticipation is usually the keenest and often the best part of any supposedly enjoyable experience. And it’s an altogether more positive and youthful emotion than nostalgia, which soon reeks of sweet decay. Thus the later in the summer you can locate your summer holiday, the longer is the enthusiastic anticipation. So when we got an invitation early in the Spring for some days of family cruising on a fine big Shannon hire cruiser on the magnificent inland sea of Lough Derg in the last week of August, we leapt at it. Yet let’s face it, it’s something of which you’d be very chary were the planned cruise on the sea, even down in our own lovely West Cork. They may have started the Fastnet Race this year as late in the season as 16th August but, as the late great Tom Crosbie of Cork Harbour was wont to observe, no prudent navigator would really want to have his beloved boat west of the Old Head of Kinsale after August 15th. However, thanks to Ireland’s wonderful inland waterways, and the mighty Shannon and Erne river systems in particular, we have an all-seasons cruising ground sufficiently varied for even the saltiest sea sailor when summer is gone. And in that last precious week of August – when just one balmy moment of a late summer’s evening is worth ten such in June – you get the perfect combination for a refreshing break from routine and a thoroughly good time with it, with the country looking its lushest best, a marked contrast to spring when it is raw and bare. Not least of the attractions of a three generations cruise is that the duties of the grandparents and grandchildren are simply to have a good time. It’s the middle generation who are there to provide planning and management. So apart from simply turning up in Portumna at the required time on a Tuesday afternoon, our only task was to get a proper lifejacket for Pippa the Pup, who isn’t really a pup, she’s a three-year-old miniature Jack Russell terrier, but there’s still a lot of the puppy in her. As it was the only job we’d to do, it got huge attention, but thanks to CH Marine’s crisp online service, Pippa had her new outfit many weeks before joining the boat, and almost immediately she realized that wearing the lifejacket was all about having a good time, so no problem there. We eased ourselves gently into the Shannon pace by stopping off from the journey westward in Nenagh for lunch at Country Choice, Peter & Mary Ward’s wonderful little food emporium. They don’t so describe it themselves, but “emporium” is the only word to describe a miniature Aladdin’s cave of goodies and wonderful food. This energetic couple were in something of a state of excitement, as the entire Ward operation had just received the word that they were short-listed for an award in the “Best Shops in Ireland” competition, the announcements to be made that weekend. So it gave us something more to anticipate as we cruised Lough Derg during the following five days, for although much of our mini-voyaging was done along the luxuriant “Tipperary Riviera”, the fact that Tipperary provides some of the best agricultural produce in Ireland does not necessarily mean that it’s a county of foodies. On the contrary, at times the Tip cuisine is very basic indeed, ignoring some of the region’s finest specialities. So Country Choice in Nenagh and the Wards’ famous and enormous stall at the weekly display on Saturdays in the Milk Market in Limerick are beacons of hope and places of cheerful pilgrimage for those who think we Irish could make better use of our wonderful natural local produce. Portumna at the north end of Lough Derg is a strategically vital crossing of the Shannon – the next bridge is well to the north at Banagher – so inevitably Portumna is a workaday, strung out sort of town with a decidedly utilitarian air to its hire cruiser base at the evocatively-named Connaught Harbour. But the word is that Waterways Ireland have some worthwhile plans to upgrade the entire Portumna-Shannon-Lough Derg interface, though it won’t include replacing the swing bridge which takes the main road across the wide river. Our skipper was already devising a cunning scheme to deal with the dictatorship of the bridge’s opening times even as we were arriving aboard and exchanging a hurried hullo and goodbye with the previous generation on the distaff side, who had cruised with son-in-law, daughter and grandchildren up to Lough Ree. The vessel at the centre of this hectic multi-family interchange was the 42ft Slaney Shannon Star, a fine old workhorse which has been giving sterling service to Emerald Star Line clients for more than two decades. In fact, the Shannon Star Class is quintessential Emerald Star, as just 15 of them were built by Broom’s of Norfolk, and they were exclusively for the Irish company, which worked closely on the design and specification to produce the perfect boat for Shannon cruising. This creative combination produced a comfortable and practical non-nonsense layout, with a straightforward finish which doesn’t pretend to be anything unnecessarily fancy, and a useful big Perkins 76hp diesel which gives the very able and “lakeworthy” hull a cruising speed of 7 knots. This layout plan gives the broad outline of the Shannon Star’s very effective accommodation, but the forward cabin is roomier than shown, with proper gap to open the door fully. Within this package, as the layout plan shows there is comfortable accommodation for six without using the settee berths in the saloon, there’s also an extra berth in its own little cabin just under the in-saloon steering position (it became Pippa’s cabin when we were ashore to dine), and while steering from the inside position is very comfortable with good visibility, the flybridge offers splendid views and is sufficiently large to be sociable with it. Those who sailed with our son David when he was campaigning the likes of the Corby 36 Rosie (now Rockall III) and other offshore racing machines a decade ago will know that he thrives on planning and execution, while his wife Karen is more than a match for him. Thus for Georgina and Pippa and me and Matthew (aged 6) and Julia (aka The Diva) age 3, it was just case of being here and going with the flow and being prepared for enjoyment, for there was a lot of that. David’s plan for the first evening in Portumna was typical of the man. They’d spent a fair bit of the day completing the final stage of the long passage down-Shannon from Lough Ree, so time ashore in a hospitable environment with food available was the target. He came up with the scheme that we’d go for supper at the very characterful Ferry Inn just across the river. But before that, we’d take the boat through the swing bridge at the 7.45pm opening, and berth her at the pontoon immediately below the bridge, which would shorten the walk to the inn, and also make it free choice for departure time in the morning. But this was only the beginning of the man’s ingenuity. Supper was well under way in the pub when he suggested that if the senior men didn’t linger too long over the puddings, they could use the last of the daylight to take the boat the mile or so to the little harbour at Portumna Castle, while the women and children – by now immersed in various electronic games and slow eating – could follow when ready by taxi. Sounds crazy, but it was a move of genius, for the berth beside the bridge is noisy with the road traffic and doesn’t give a sense of being away from it all, whereas the tiny harbour at the castle is pure holiday setting. The only fly in the ointment of this perfect plan was that as we approached the little harbour in the very last of the daylight, it was to find the entrance well-filled with a Shannon barge, but somehow we squeezed our 4.1 m (13ft 6ins) beam in past, and then there was just one space left in the most sheltered corner of this attractive mini-port to provide Slaney Shannon Star with a sweet berth for the first night of the cruise, and a warm wecome for the rest of the crew when they arrived in their own good time. We’re no strangers to three-generational family holidays, but have less experience of three-generational lake cruising, and of course as the kids are growing up so quickly, the requirements vary from year to year. So in the morning sunshine, while the senior adults with an energetic little dog might have felt like no more than a walk in Portumna Forest Park, the parents with children had to seek out a proper children’s playground, but a skillful combination of plans saw all wishes in the walkies department being well met. It has to be said that Portumna is definitely tops in at least one department. The Children’s Playground - it’s between the castle and the town - is world class, a creation of Cavanagh’s of Roscrea. They were established way back in 1806. But I doubt if their metal-working skills were being deployed for children’s playgrounds when the company came into being while Napoleon was still strutting his stuff around Europe, so all power to Cavanagh’s of Roscrea for adaptability. As for Portumna Castle…..well, if you find your household heating bills depressing, cheer yourself up with the thought of the effort it seems to have taken to heat Portumna Castle. You’ll seldom see chimneys on this scale – it must have taken all the turf out of an entire raised bog eevry winter to heat this massive pile. By complete contrast, back at the Castle Harbour we met up with a Polish sailor who had cruised the Baltic before he set off to start life anew in Ireland eleven years ago, and when he discovered the Shannon and all its attractions he moved aboard a little sailing cruiser eight years ago. He has lived on her ever since, in and around the Shannon lakes, and is well content, though when I guessed his boat might be an Anderson of some sort, he was very positive in making sure that I realized his beloved Triskel was an Anderson 22 Mark 2, and not one of the inferior original Mark 1 versions. Having been bemused by contemplating the heating bills for Portumna Castle, I didn’t find out his name before he headed out of port, but by this time our skipper also reckoned it was time to go. David had an app which gave weather predictions so accurately that he could tell you exactly when the rain would fall on different parts of the lake, precisely how big the rain-drops would be, how long they’d be falling, and how much wind would be in the midst of them. Or so it seemed to the rest of us. But somehow he got us all moving together aboard ship out of Portumna Castle Harbour at morning coffee time, and we proceeded southwards down the splendid lake almost entirely in sunshine as big dark rain squalls ran north along the Atlantic seaboard to the west, while over to the east it was pitch black over mid-Tipperary and they’d some flooding. Yet aboard Slaney Shannon Star, this helmsman on the flybridge managed to get a bit of a suntan during the two hours plus passage down to Mountshannon. Lough Derg is 40 kilometres long (it’s 23 land miles in old money from Killaloe Bridge to Portumna Bridge) and around 20 kilometres across its widest part, but it follows the contours as befits a developing river valley to provide a handsome convoluted lake. While the coastal scenery is fairly flat up about Portumna, as you get south past Dromineer the land is rising to port and particularly to starboard, with the final approaches to Killaloe between the Arra Mountains and Slieve Bernagh becoming quite spectacular. In classic cruising style, our skipper had decided the best way to deal with the lake was to get down to Killaloe on the first day, and then cruise back to Portumna at a much more leisurely pace. But even when you’re trying to log the miles, Lough Derg offers ample choices for quick stops, and as the weather app was talking about some decidedly lively southwest to west breezes later in the afternoon, the logical place for a stopover was Mountshannon. This would mean that if the top did come off conditions for a while, we’d be located so that we could hold round a weather shore to get a smooth passage into the long “reverse estuary” down to Killaloe. But first, we’d to enjoy Mountshannon. It’s headquarters of the Iniscealtra Sailing Club (Iniscealtra is the neighbouring holy island, complete with Round Tower and a place of pilgrimage), but Mountshannon has the additional advantage of being serenely south-facing over a fine but sheltered bay, and it is home to an impressive fleet of yachts lying in a classic anchorage. There are the likes of Hallberg Rassys among them, and if you wondered what on earth a Hallberg Rassy ocean cruiser is doing on a lake, we suggest you get to Mountshannon and understanding will come. We meanwhile understood that rain was coming, and fast, so after a neat bit of berthing even if I do say so myself, we nipped up to the village inn and took aboard broth and stews while the rain battered the street outside, and German and English visitors supped their pints of Guinness with that happily bemused little smile you’ll see on the faces of tourists who have discovered an Irish inn exactly as they hoped it would be, including the rain outside. But even that cleared on cue, and we needs must visit Mountshannon’s unique attraction, the combined labyrinth and maze. A perfect opportunity for junior scouts to guide the oldies about. However, the wind had come through as expected, so much so that Mountshannon’s famous white-tailed sea eagles appeared to be grounded for the afternoon. But though Slaney Shannon Star was sitting serenely in a wellnigh perfect berth for a stormy night, the menfolk were just too interested in seeing how she’d perform in a real breeze of wind, with a bit of a sea running, to stay on in the same place. “It’ll only be slightly lumpy for a few minutes” was the mantra. And it has to be said the old girl coped superbly, though fortunately all warps had been lashed in place, as for a little while -until we were feeling the shelter of the Clare coast in under the delightfully-named Ogonnelloe – some quite substantial quantities of Lough Derg were sweeping at speed over the Slaney Shannon Star. But in the Killaloe estuary, relative peace returned, the black clouds raced away to the east, the sun came out with a rainbow, and there was this sense of approaching somewhere important, heightened by the quality and variety of the lakeside and hillside houses. Some people find this Irish scattering of houses, each in its own little world, to be something of an irritation among some rather fine scenery. But I like it. There’s more than enough empty uninhabitable wilderness in the world, and except for the most spectacular mountains, Irish scenery is enlivened by houses dotted here and there in such a way that you think pleasantly of the agreeable way of life that might be found in them. Once we were into the smooth water, Madam got on the phone to suss out the possibilities of an “Objective Achieved” supper at the renowned Cherry Tree on the Ballina side of Killaloe, and of course chef patron Harry McKeown himself answered the phone and recognized her voice immediately. But he went through the formality of booking a table for six in impersonal style before letting her know her cover was blown. Whatever about Georgina’s problems in dining anonymously, for the rest of us it made for a idyllic evening, with the boat berthed as conveniently as possible at the berth generously provided by the Lakeside Hotel, the shortest walk imaginable to the Cherry Tree, a riverside window table to admire a sister-ship berthed directly across the water on the Killaloe side, and food glorious food while the light lingered in a fair approximation of a summer’s evening. An interest in visiting Killaloe Cathedral in the morning had been expressed, so lo and behold our thoughtful skipper moved the boat across river in the morning on his own while the rest of us were still bestirring ourselves, thereby removing the need to walk across Killaloe’s ancient but much overworked bridge. It suffers from ludicrously excessive traffic – the lovely little riverside town does really urgently need a by-pass and the long-planned new bridge to the south. But St Flannan’s Cathedral well exceeded expectations. It’s of very modest size for anyone expecting a Shannonside version of Chartres or York Minster. But we knew it well from the outside, yet going in was a revelation, a haven of total peace in this Cathedral of the Waterways. There seemed to be an unspoken agreement that we weren’t going to break the spell of peace by walking across the bridge, but as this meant the kids couldn’t avail of the playground on the Ballina side, it was a case of up sticks and away from the impressive new Waterways Ireland pontoons on the Killaloe side, and off we went north and east to Garrykennedy with its handy playground, on the way passing learner sailors in action off the University of Limerick’s Activity Centre on the Clare shore, and then – for it was a pleasant sunny sailing day after Wednesday’s weather kerfuffle – we passed a real live sailing cruiser going on her merry way, plus several powercruisers. All the little ports about Lough Derg have their own individual character, and Garrykennedy is about as different as possible from Killaloe, which in turn is very different from Mountshannon, while Dromineer – where we were to spend the night – is different again. So keen is Limerick to get its Guinness that in a storm one winter a canal boat (they were never called barges in their working days) headed out after sheltering in Garrykennedy and sank off Parker Point taking some of her crew down with her, but that’s a sad story for another day. For we got into Garrykenedy on a sunny day to find a handy berth in the old harbour, a good lunch in Larkins, and a classic Children’s Playground with real old-fashioned swings where Matthew and Julia proved fearless. By the time you’re a day or three into your Waterways holiday, you lose track of time, but I think it was later that afternoon when the Slaney Shannon Star headed in the sunshine across to Dromineer. There, we found the most-sheltered spot at the quayside in the harbour was entirely taken up by a slovenly-berthed J/24 which, if it had been secured in a more thoughtful manner, would have left plenty of room for other boats. However, the nearest handy berth put us right beside the playground, so bonus points for Dromineer. And then, as we had access to sheltered water, it was time for a bit of fun with the outboard dinghy, which was a winner with the kids, who were soon helming it with skill. You’d expect that of Matthew – he has helmed a Howth Seventeen – but Julia at just three years old was a very cool and quick learner. An overnight in Dromineer means supper at The Whiskey Still, and very good it was too, a real local which comes pleasantly to life as the evening draws on, and lots of folk to talk to about this intriguing place, which in the great days of Waterways transport, was by way of being the main port for North Tipperary. But since 1835 it has also been the home of Lough Derg YC, whose fine clubhouse was taking a brief rest between the excitements of the annual Lough Derg week and the imminent arrival tomorrow of the international fleet of cruising-racing Wayfarer dinghies. The last walk of the day for Pippa discovered an energetic game of kayak polo under way off Dromineer’s little beach (yes, they really do have a beach, the immaculately-kept Dromineer has everything) but later that night the breeze freshened again and our fenders were squeaking a bit. 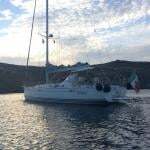 We couldn’t be having that at all, so the skipper found us enough room along the other quay for us to warp into a berth where the breeze held us noiselessly off the wall for a night of peace. By this time we were so totally into Waterways time that I haven’t a clue when we left Dromineer next day, but we seem to have crowded several days of living into a morning. The playground had to be given a thorough work-over, the dinghy had to be taken out for a spin at least twice, then Pippa had her morning walk along to Shannon Sailing’s secluded marina where of all people we met up with the great Dennis Noonan of Wicklow and Round Ireland Race fame. 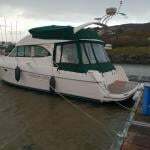 He was aboard his able little Pegasus 800 which is for sale, and is a fine sailing cruiser if you’re interested in a proper yacht with full standing headroom. But there was little enough time to discuss boat sales, for in real life Dennis is a market gardener of long experience, so he and Georgina were immediately at it yakking away about genuine local produce and how to get people to appreciate what their neighbourhood can produce in season. I meanwhile wandered off meet up with Robbie the Main Man in the workshop, and soon discovered he was the owner of an enormous 95ft boat – the Spera In Deo - which was lying in Dromineer harbour, a former Dutch mussel dredger which he had discovered in a ruinous state in Donegal after a fire. He was able to make her sufficiently seaworthy to bring her south along the Atlantic seaboard and into the Shannon crewed by all the usual gallant suspects, and while he still has much cosmetic work to do to the exterior, he has fitted out the interior in the most extraordinary way to make her the biggest four berth motor-cruiser in the world, as there are two enormous en suite double cabins - one with a Jacuzzi - while the headroom in the vast main saloon is theatrical in scale. Eventually I was reunited with my brood in the Lake Café right on the harbour. It’s open from 8.30am until 5.0pm, which makes for a very civilised little village arrangement as The Whiskey Still then opens up for food. Declan & Fiona Collison, who run the Lake Café, used to run The Whiskey Still, so they know the Lough Derg hospitality scene inside out. But like everyone along this ancient waterway, they are as keen to talk about its fascinating past are they are interested in its present and future, and the Lake Café’s walls are adorned with aerial photos of Dromineer from around 1967 which really do bring home to you how much Ireland has moved on during the past half century. Dromineer as it was in 1967 – photo courtesy Lake Café. Not everything has come through intact or improved, however. Heading up-lough later that day in vivid sunshine, we went close past Illaunmore, Derg’s biggest island, where very many years ago we discerned what looked like a tiny creek leading to a little harbour. Though it was obviously private, our curiosity got the better of us, and we negotiated our motor-cruiser through the narrow gap to find a harbour. There was a small waterside chalet and a man out for a walk with his very tame golden pheasant, which we later learned was called Sammy. This was the late Martin Winston, and Illaunmore was the love of his life. He was never happier than when on his own island. But that was a long time ago. Martin Winston is long gone. And as far as we could see, the lovely little harbour where we were made so welcome with a fantastic spontaneous party generated within minutes, it now all seems completely overgrown. But while the harbour in Illaunmore may have disappeared in the undergrowth, the other port of that day’s cruising so long ago, Terryglass, has come on with leaps and bounds. Indeed, when we visited Illaunmore with its fine little harbour, there was virtually no harbour at all at Terryglass, you berthed in a sort of creek where cattle came to drink lake-water. And the first time we were there being Hallowe’en night, the track up to the village where a friend had just bought the pub was quite a spooky experience. But today Terryglass is one of Lough Derg’s more glamorous ports, while it’s a special place for David and Karen, as they were married in the lovely church in the village, that church whose spire is “Conspic” from all parts of the north end of the lake. But when you’ve a couple of lively kids, there’s no time to be sad or serious about the old days and disappeared harbours or new harbours and whatnot. They’ve splendid reed beds at Terryglass, and disappearing completely into the reeds is a natural challenge for youngsters with an outboard dinghy, so that was on the agenda before we ambled up to the village and supper in the Derg Inn. It wasn’t a restaurant crawl we were on by any means, but brisk days on the lake are great for the appetite. That last day was typical. We’d the usual good breakfast on board, then after everyone went off on their various pursuits, we’d one of those light “Meals-without-a-Name” with the Collisons at the Lake Café, as their baking is superb. Then when we berthed in Terryglass, somehow Karen had another meal-without-a-name ready on the saloon table, followed by more reed-bashing-by-boat, and then with the kids needing an early meal followed by a reasonable bedtime, we fed well but early in the Derg Inn. There, I fearlessly rounded out the feast with a Pineapple Boat with strawberry ice-cream, raspberry coulis and cream – definitely not a nibble for the faint-hearted. Then back at the harbour where the kids went to the limit and beyond on old-style swings in the playground, with people arriving down to join their Terryglass-based cruisers for the weekend we could admire an extraordinary selection of dogs even unto an Irish wolfhound, and not a lifejacket among them except for Pippa. And after all that, the little people went willingly to bed, and in truth the rest were soon headed the same way. Changeover Saturday at a hireboat base is so busy there’s not time to be sad that it’s all ending. We were perfectly on time across from Terryglass for the 0945 bridge opening at Portumna, there was a berth stern-to right beside the cars, there was the usual final check round to make sure we’d left nothing behind, and then we were gone, only pausing briefly to hope that whoever next took the gallant Slaney Shannon Star down the short channel to the river and the lake was going to have at least half as good a time as we’d had. But now the grandparents weren’t too tied to time. We could go home at leisure, ambling by road on up the Shannon, stopping here and there at river ports which are very different in character from lake harbours. Yet all have their special charms, so it was after dark when we finally got home. It wasn’t until Sunday that we finally opened Saturday’s Irish Times. And there was the announcement that Peter & Mary Ward’s fantastic weekly display of everything good in the Milk Market in Limerick had won the prize for the Best Market Stall in Ireland. #royalcanal – Spencer Dock Sea Lock at the Royal Canal in Dublin has been closed til further notice due to unforeseen repair requirements at one of the lock gates. Upcoming Newcomen Bridge Lifts are also cancelled until these works can be carried out. Waterways Ireland has apologised to customers for inconvenience caused and say they will issue an update notice when further information is available.